The Invesco S&P 500 High Beta ETF (SPHB) is an exchange-traded fund (ETF) that tracks a benchmark that consists of the most eminent and successful companies in the United States. Indeed, many of these “blue chip” companies are large-cap household names and have played an important role in shaping the modern American economy. In a way, this is a good thing as these companies are statistically unlikely to suddenly fold or have their stocks lose a substantial amount of their value unless the economy were to undergo a severe fall. Thus, the level of risk inherent in this ETF is lower than average. “Blue chip” companies also pay out sizable dividends when compared with smaller or less-established companies. 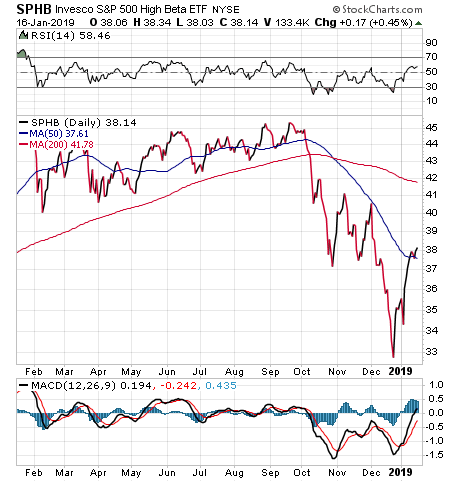 Interestingly, SPHB is used by many portfolio managers to get “risk on,” meaning that when the market is trending higher, we see money move into the fund for general exposure to the markets. Conversely, when markets go “risk off,” money tends to move into other ETFs, and one such fund is the topic of next week’s ETF Talk. At the same time, the fact that these companies are so massive, largely precludes the possibility that the value of these related stocks will rise dramatically soon. Most of their fast growth occurred in the past and, as Apple (NASDAQ: AAPL) has shown us, one-time growth stock stars can have trouble creating new and innovative products that are on par with the ones that initially launched their explosive growth. Even though 36% of the fund’s holdings consist of technology stocks, SPHB also has significant investments in the financial, health care, industrial and communication sectors. Virtually all the fund’s holdings are based in North America and the rest are in Europe. Some of the fund’s top holdings include Netflix (NASDAQ: NFLX), Nektar Therapeutics (NASDAQ: NKTR), Incyte Corp (NASDAQ: INCY), Applied Materials Inc. (NASDAQ: AMAT), Caterpillar Inc (NYSE: CAT), NVIDIA Corp (NASDAQ: NVDA) and Adobe Inc. (NASDAQ: ADBE). The fund currently has $96.68 million in net assets, has a $4.27 million median daily volume and has an average spread of 0.06%. It also has an expense ratio of 0.25%, meaning that it is slightly more expensive to hold in comparison to other exchange-traded funds. In short, while SPHB does have several advantages over some of its peer funds, its risks are not zero. Interested investors always should exercise their due diligence and decide whether the fund is suitable for their portfolios. Jim Woods discusses Dr. Copper's diagnosis of the market and a new ETF.